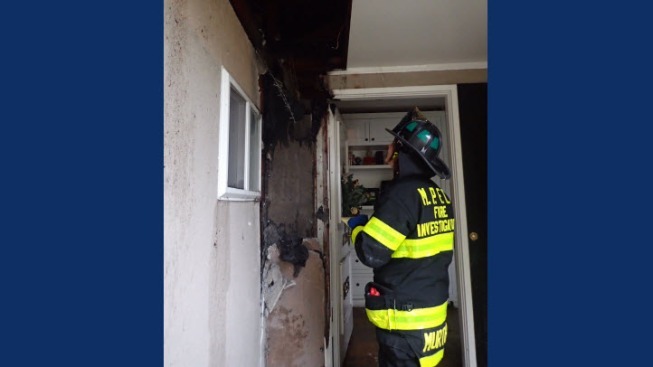 Firefighters in Menlo Park on Saturday morning responded to a residential structure that they believe was started by a squirrel. Crews arrived at 6:17 a.m. at a residence on San Mateo Drive on a report of smoke coming from the home's roof. A neighbor, who happened to be a retired Menlo Park Fire Protection District assistant chief, was out walking his dog when he noticed the smoke and alerted another neighbor to call 911. Responding firefighters found heavy black smoke coming from the single-story home and learned the fire was burning around the door casing of the front door. The fire was brought under control at 6:31 a.m.
Investigators and PG&E crews responded to the scene and later determined a squirrel had chewed through a wire at a nearby power pole. The chewed neutral wire dropped onto the power line to the home. This caused the entire home to energize, which caused the fire, according to the fire department. The damage to the home was estimated at $5,000, but that estimate could go higher if it is determined there is further damage to the home's wiring system, appliances, fixtures and devices. Firefighters left the home around 8:30 a.m. but had to return at 10:30 a.m. due to a hot spot in a wall next to the home's main electrical panel. As of earlier today, firefighters were still monitoring the home and using thermal imaging devices every few hours to check the residence. In August of 2016, a squirrel bit into a power line and caused a transformer to explode, knocking out the power to downtown Menlo Park and impacting more than 1,000 customers, Fire Chief Harold Schapelhouman said.